Sunday morning came quickly, and as promised with it came bad weather. I didn’t know it going into the water, but apparently ‘bad’ was a huge understatement. I don’t remember it raining when I started the swim, but recall feeling some raindrops as I exited and reentered for the second lap of the swim. I held my ground just left of the cable which sits just below the water’s surface along the course. Everyone talks about this cable being a huge gamble, but I have always had complete confidence in my swim, and am not afraid to take and/or throw a few elbows to hold my ground in the water. I think this helped me greatly as I was on pace to have a 1:10 swim split after the first loop. 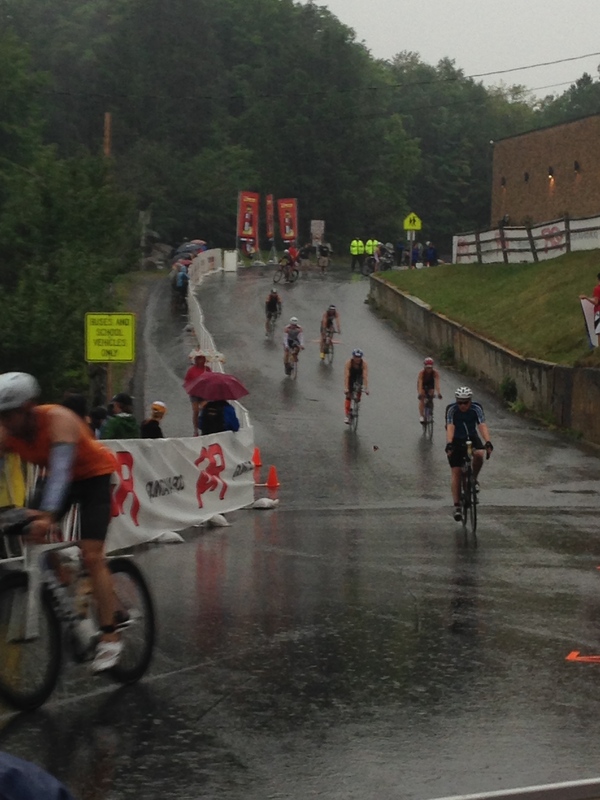 Again, I felt a little rain as I entered the water for my second loop, and continued to feel raindrops through out my time in the water for this second lap. I was nearing the swim exit and was about to get a very rude awakening regarding the weather. When I got out of the water at the end of my 2.4 miles, it was pouring. And having taken just a few steps onto the beach, there was a huge flash of lightning following a booming crash of thunder. I made my way toward T1, and there was already flowing and standing water in the streets at least an inch deep. At this point I knew i was in for a long day. 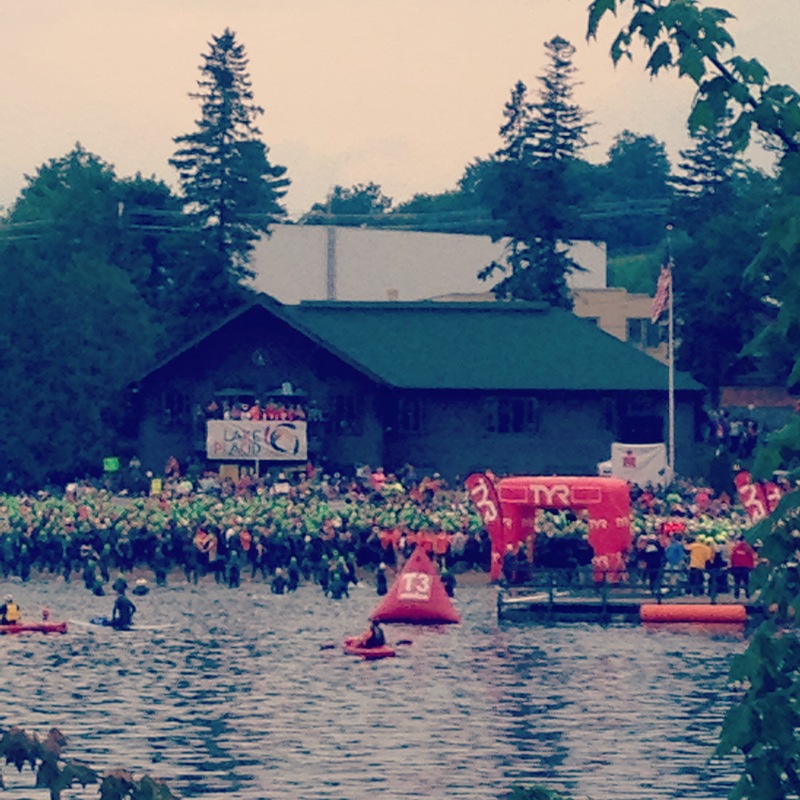 I would later learn that a good majority of the field was pulled from the water before finishing their second laps for safety reasons, and because of this, Ironman would not be considering the time for the second swim lap or first transition as some athletes exited the water as far as a mile from transition onto private docks. 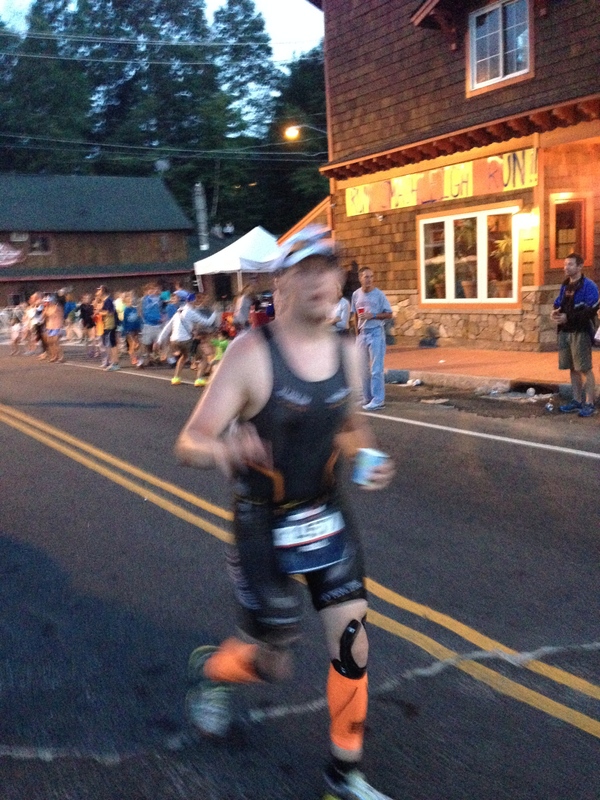 I carefully made my way into transition and grabbed my swim to bike bag and made my way toward the changing tent. As I was quickly drying off, putting on my socks and bike shoes, and strapping up my helmet, the rain continued to pound the top of the tent and thunder boomed. I exited, feeling confident in my handling skills in such severe weather, even though I had never ridden in such conditions, and would probably never think to ride in such terrible conditions, but I had ridden in rain before and knew to take my time. The ride out of Lake Placid was horrible. The center of the storm seemed to be getting closer and the lightning bolts illuminated the sky as the cracking thunder rattled the bike frame. I hit the point of the ride that concerned me the most in the pouring rain, the descent into Keene. I knew riding the brakes too hard could cause me to lock up my wheels, but high speeds could also be dangerous, especially since the rain drops were hitting me in the eyes almost like a sand storm. So my choices were…let it rip and fly down the descent mostly unable to see, or ride the brakes, take it slow mostly unable to see. I went with my first option, but made sure to give myself plenty of room passing other riders and on the turns. I saw what was likely the greatest sight of the day and that was the “Welcome to Keene” sign which signified to me the end of the descent. I thought to myself, “Okay, we’re still here. The forecast called for the rain to dissipate before the early morning, we should be good to go moving forward.” That was mostly true. I took my first race spill from the bike at the first aid station after the descent. There was a botched hand off between the rider ahead of me and a volunteer which caused him to go down while I was simultaneously trying to grab a bottle from a volunteer myself. In trying to avoid the rider down ahead of me, I too went down. I tore up my kit and got some pretty good road rash on my right elbow, hip, and shoulder, but got up, checked out my bike, saw it was good to go, mounted and kept moving. The pounding rain here stung terribly, but there was nothing that was going to stop me. The crash took a little out of me and it took the next five to ten miles to get it back. It helped that during this time, the rain stopped and the sun came out, but I was back, and I was hungry. 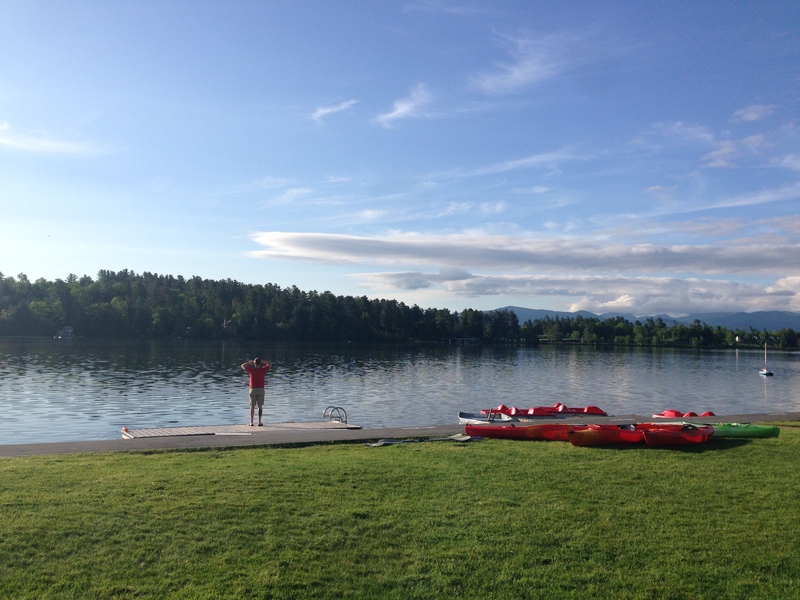 I hit the climbs back into Lake Placid as hard as I could, and began my second loop of the bike course. The second lap seemed to fly by with the sun shining bright, the sun shining bright, and the water in the street beginning to dry up. I rode back into Placid, made that last turn toward the oval, and dismounted. I handed my bike off, and the volunteer who took it asked if I was okay. I had absolutely no idea they were even talking to me and was just like, “Yeah, great. Why?” They simply told me the med tent was ahead if i wanted to check in…I then remembered I had fallen and stopped in quickly to have them clean me up. I immediately regretted the decision to check into the med tent….mostly because the bandages they put on fell off almost immediately because of sweat and rain. They also asked what seemed like hundreds of questions about how I felt and if I knew what day it was…I guess they wanted to make sure I didn’t have a serious head injury, but I was more concerned with getting back to my race than I was with answering their questions. Their last question I remember being “Are you going to go back there,” to which I replied, “Hell yeah!” and made my way toward T2. I quickly changed my socks and shoes, removed my helmet, threw on my hat and sunglasses and headed out to the 26.2 mile run. I saw Amy at the exit of transition and she seemed concerned, I saw her briefly at the end of the first bike loop and I’m sure she must have seen my torn race kit and bloodied right side. I assured her I was fine and that it must just look worse than it is, because I felt no pain and just wanted to get to running. I started the run feeling great and the energy from the spectators was amazing! The first mile or two flew by, and soon I was out of the main part of Lake Placid running past the airport and into the long mostly straight out and back. I started walking at some point, but somewhere along the way something just clicked and I said to myself if you aren’t dead or injured keep running, and run I did. The rest of the way I ran everything that wasn’t a terrible uphill, not really fast necessarily, but I ran. I eventually found myself nearing the end of my second lap of the run in the last miles of my marathon feeling great and running toward a one hour marathon PR from what I had run in Louisville one year earlier. Running into the oval was completely electric! 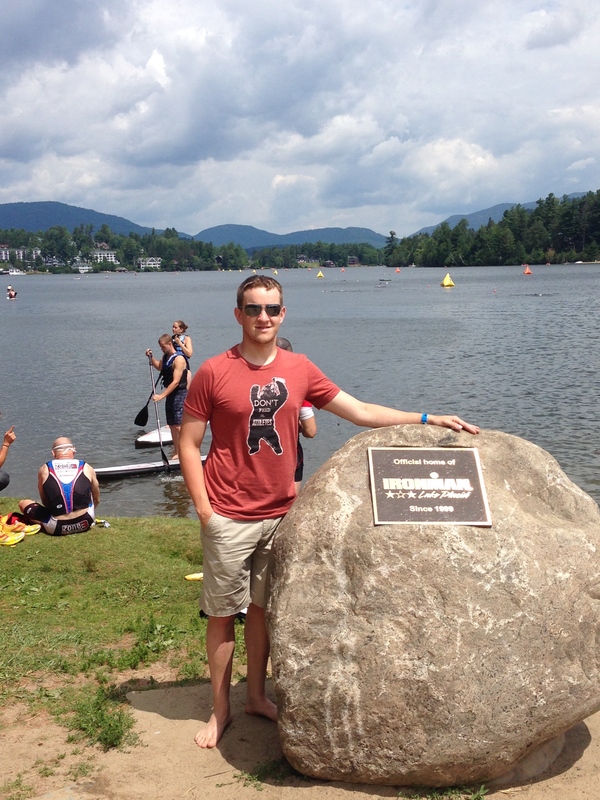 It is hard to describe the feeling you get as you near the finish line of an Ironman Triathlon. It really cannot be described unless you experience it as an athlete or as a spectator…just something else. I made a point to make sure I found Amy this year, as in Louisville I ran right by her without even acknowledging her (there is a video of this out there somewhere). This year, we tried to talk about where she would try to be as I came up the finish chute and I made sure to look there…and luckily found her. The lights are completely blinding and it is so loud, but this year I found her before I crossed the line and got my long-awaited, well deserved “Paul, you are an Ironman!” for the second time. After the race I again went into the med tent, and again I regretted it. They rinsed the road rash, and applied some haphazard bandages, but ultimately I again found this useless…especially because the tent was heated and then I had to go back out into the cool night and being so depleted of energy just couldn’t get warm again. I shivered my way back to our hotel and took a cold bath before getting dressed and walking across the street to the dancing bears for dinner. My road rash from the crash was finally starting to hurt…a lot. I really wanted to walk back down to the finish line to cheer in the final finishers, but considering I was in some considerable pain, freezing, and almost fell asleep in the booth eating, we decided to head back to the hotel. Next year, I am going to make sure I have some thermals for after the race so I can be out at the finish line all night!